I love Indian food. Not too hot, but a gentle aroma of mixed flavours can really bring a dish to another level. 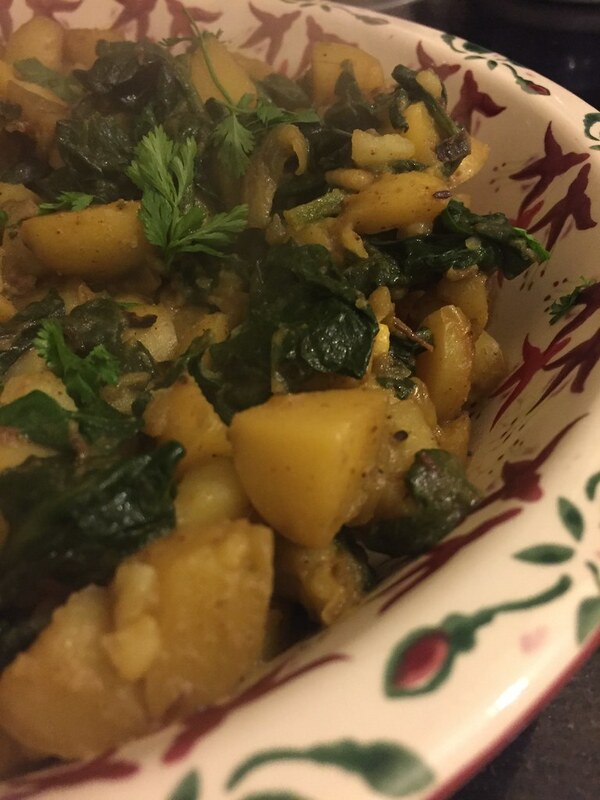 Saag Aloo is a recipe that nearly always includes spinach and potatoes. It is most common in the Punjab region, though is also eaten in Nepal, often with goat. Of course, when I cook curries it’s really just an excuse to make some naan bread. There’s something about the soft billowy flat bread that is just MADE for moping up sauce. No curry chips around here! Vegetable oil, for frying, I use sunflower oil Please don’t use olive oil, I know it’s pedantic but it’s too much “fusion” for my liking. Plus you need the higher smoking point from a vegetable oil. 500g of waxy potatoes. These are not native to our shores. And although I’m pedantic about this, in this caseI make an exception. It’s just not right without the tiny little spuds. Cut these into 1 cm cubes. Heat the oil in a large frying pan, add the cumin seeds, and don’t move from the pan until they start to pop. At this stage turn down the heat and add the onion. Season and cook these gently over a low heat, stirring constantly until they are caramel in colour. Add the garlic. Stir for 1 minute more. Turning up the heat, add the potatoes, ginger and spices. 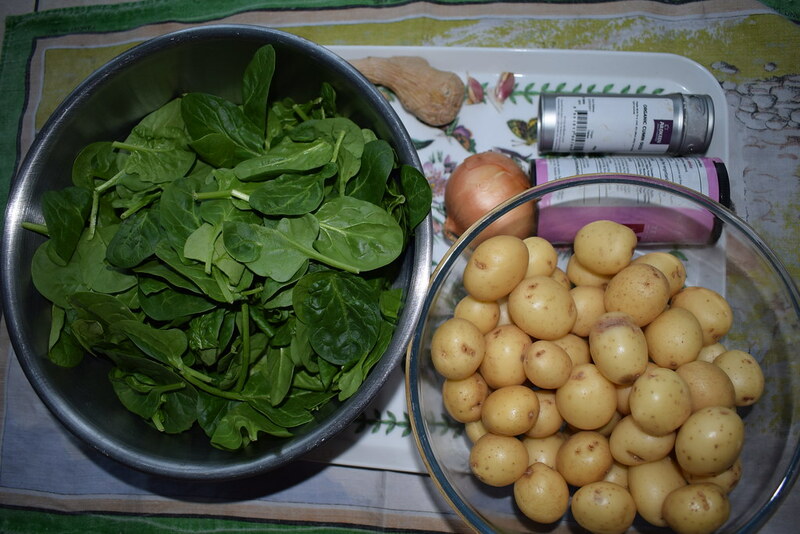 Add 500ml of water and cook gently until the potatoes are ready. Stir every now and then. 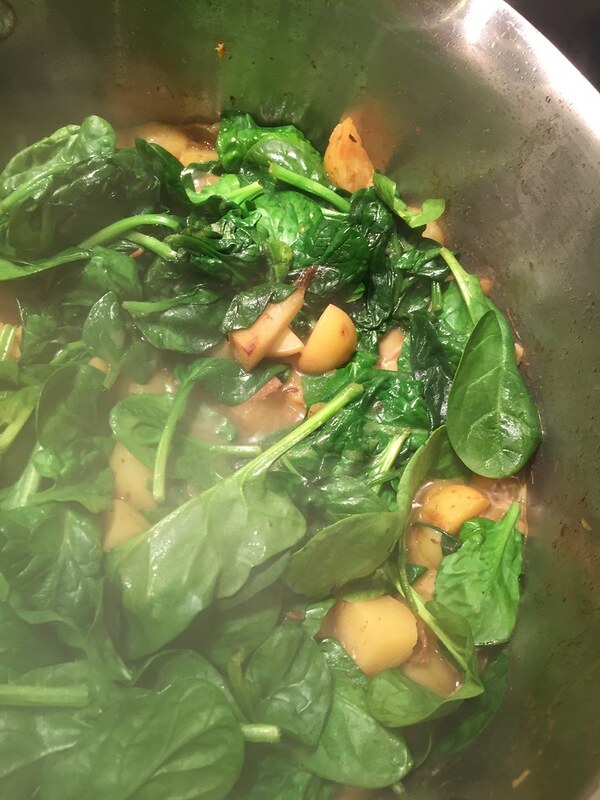 Finally stir in the spinach and cook for about 5 minutes until the spinach is wilted. Check the seasoning again. Divine just like this. But you could serve this along side some roast lamb for a lovely dinner party treat.